In announcing she would vote to confirm Supreme Court nominee Brett Kavanaugh, Sen. Susan Collins said Judges Kavanaugh and Merrick Garland “voted the same way in 93 percent of cases they heard together” on the federal appeals court in the District of Columbia. This is evidence, she said, that Kavanaugh is “more of a centrist” than his critics say. But a high rate of unanimity is not unusual among appellate court judges or indicative of how one might rule if elevated to the Supreme Court, as the nonpartisan Congressional Research Service wrote in a recent report on Kavanaugh and his potential impact on the high court. 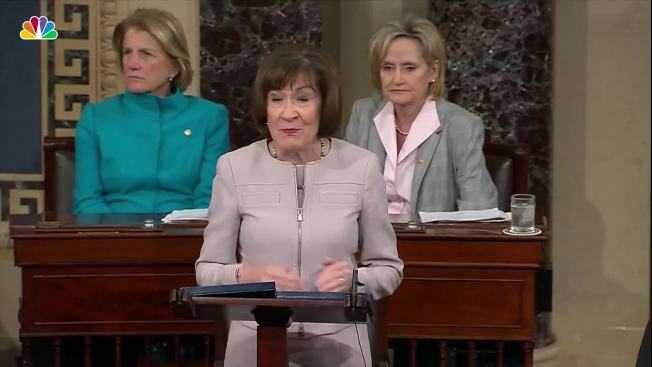 Collins’ remark came during a floor speech to announce that she would vote to confirm Kavanaugh. At one point, she compared Kavanaugh to Chief Judge Garland, one of his colleagues on the U.S. Court of Appeals for the D.C. Circuit. Garland, of course, was President Barack Obama’s nominee to the Supreme Court in 2016. Republicans blocked the nomination, refusing to hold hearings and insisting on allowing the next president to make the nomination. Collins, Oct. 5: That Judge Kavanaugh is more of a centrist than some of his critics maintain is reflected in the fact that he and Chief Judge Merrick Garland voted the same way in 93 percent of the cases that they heard together. Indeed Chief Judge Garland joined in more than 96 percent of the majority opinions authored by Judge Kavanaugh, dissenting only once. These statistics are frequently misused. We dealt with a similar claim in 2017, when Neil Gorsuch, now a member of the Supreme Court, was nominated by President Donald Trump. In that case, the Trump White House touted the fact that Gorsuch sided nearly 99 percent of the time with the majority on the 10th U.S. Circuit Court of Appeals and that 97 percent of the court’s rulings were unanimous. As it did with Gorsuch, CRS issued a report that explained why there is such a high rate of unanimity on appeals courts. For one thing, appellate court judges are “bound by Supreme Court and circuit precedent,” and “not normally in a position to espouse freely their views on particular legal issues,” CRS said. Also, unlike the Supreme Court, the appellate court cannot pick and choose what cases to accept — it is required to hear all appeals — and “a lot of cases are just slam dunks,” as Christopher A. Cotropia, a law professor at the University of Richmond, told us last year when we wrote about Gorsuch. CRS, Aug. 21: The difficulty in attempting to predict how a nominee will approach the job of being a Justice remains even when the nominee has had a lengthy federal judicial career prior to nomination. Federal judges on the courts of appeals are bound by Supreme Court and circuit precedent and, therefore, are not normally in a position to espouse freely their views on particular legal issues in the context of their judicial opinions. Moreover, unlike the Supreme Court, which enjoys “almost complete discretion” in selecting its cases, the federal courts of appeals are required to hear many cases as a matter of law. As a result, the courts of appeals consider “many routine cases in which the legal rules are uncontroverted.” Because lower court judges are often bound by Supreme Court and circuit precedent, moreover, the vast majority of federal appellate opinions are unanimous. Perhaps indicative of the nature of federal appellate work, the vast majority of cases decided by three-judge panels of federal courts of appeals are decided without dissent. While the D.C. Circuit, where Judge Kavanaugh serves, witnesses more dissents on average than its sister circuits, the overwhelming majority of opinions issued by the nominee’s court are unanimous. However, Kavanaugh stands out among his colleagues when it comes to writing separate opinions. The CRS report also shows (on Table A-1) that Kavanaugh had the highest rate of issuing separate opinions, either concurring or dissenting, (15.53 percent) and the highest rate of issuing dissenting opinions (8.58 percent) than any of the six judges on the D.C. Circuit Court from May 31, 2006, to July 9, 2018. Garland was at the bottom of that list with a separate opinion rate of 1.8 percent and a dissenting opinion rate of less than 1 percent.